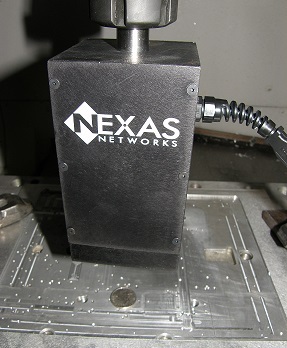 The new Nexas TooliVision™ CNC Scope System fits in any spindle normal 3/4" machine tool holder and enables a scope-like part inspection to reduce setup time, perform better calibrations and check parts after machining. A high resolution USB camera in the TooliVision™ CNC Scope System uses the machine to position the camera 2.0 inches above the part. With 20 built-in infra-red LEDs for light, the part features are magnified 40 times their size. Windows software then shows the image with a scalable circle and cross-hair calibrated to be the center of the spindle rotation for alignment. Use normal CNC motion control to move the TooliVision™ CNC Scope System around to measure and check features. This process can be done manually by an operator, or automatically with a part program. The TooliVision™ CNC Scope System is designed to work with Windows-based CNCs, PCs, laptops or our Nexas O2™ Machine Gateway Interface. Act as a visual confirmation of a location (like work zero) before cycle start..